Look of the day: winter warmth, recycled. get all of our projects done, and while I am far from done I realize it’s been a while since I posted. So I decided to do a quick look of the day. picture and I dug out some things I picked up last year that I still love. from Coco. They were a group gift last Christmas, and the black is still available on their gift wall. Ok, back to work! Hope to see you at the Snowflake Experience or the Ice Festival this weekend! Today’s look started with me messing about with the Madsy lace top & tube layers. 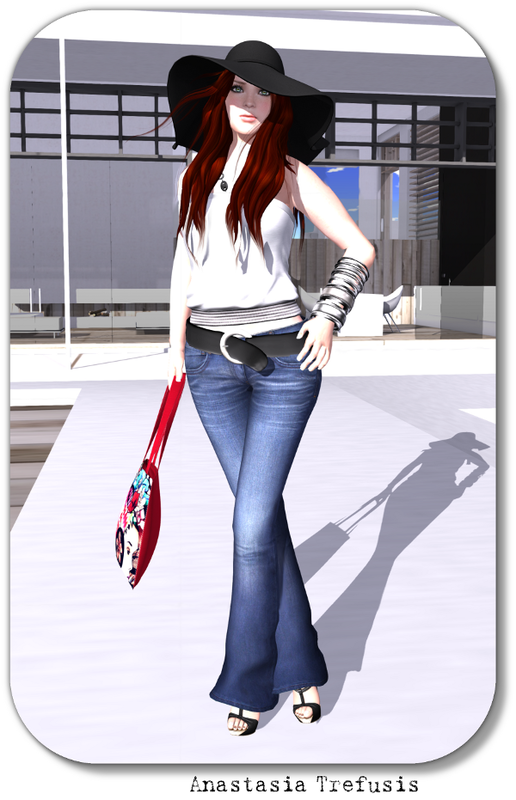 I added the Isis sheer shirt from Zaara, some jeans and slouchy ankle boots. Throw on a belt and a vintage bowler hat and she’s out the door. Where is she going? And what is in her huge tote bag? The Yfke bag is the only brand new thing today, it’s Pacadi Jasha’s subscribo group gift. It comes filled or empty, and it completed my look perfectly. I started my look with this pencil skirt from Coco. Only 50L at the mainstore, proceeds to the Red Cross for Haiti. I got this Silk Floral Shirt at Aoharu after seeing it on someone inworld. She very kindly shared where it was from. Turns out it is a men’s shirt, but I did as she had done and resized the collar and cuffs. Perfect. For accessories I started with this white Vinyl Quilted bag from Dark Mouse then added my Vaudevillian shoes from Anexx (DU3, no longer available) and nylons from Sheer. Artilleri’s Paula Glasses (black) are fast becoming my regular glasses. My colour change bauble jewellery is from Miriel and is no longer available. Sigh. So sad when amazing creators close their stores. For skin I went with 5th & oxford’s Brooke in Kitty. Nicole hair from Decoy finished my look. Today is the final day of the Aoharu sale, and last night I finally went back and bought the gorgeous fur jacket in silver, which I have been eyeing for some time. My look of the day today had to centre around the jacket, and my Maitreya Gold Shanti sandals, which match perfectly. This Coco shirred mini dress in black (group gift still available in 4 colours) and Paper Couture onyx jewellery completed the look. 5th & Oxford’s Brooke skin in Nightfall had just the look I wanted, and I dug out an old favourite, ETD‘s Ana updo. I felt stylish, like I had been out to a very glam Gallery opening or a night on the town, so I headed out looking for a great place to take pictures. A search for Paris lead me to a group of Paris Academies sims, this photo is taken on the roof of an art gallery, looking across to the Eiffel tower.